While watching the LA Dodgers take on the Boston Red Sox last week, I was particularly interested in a play which took place in the seventh inning. With the Red Sox leading 2-0, Dodgers second baseman Blake DeWitt was hit in the knee by a pitch from Clay Buchholz. As a result, DeWitt could not continue and thus was replaced by a pinch runner. Now why did I find this seemingly benign play so interesting? Said pinch runner was a guy by the name of Chin-lung Hu. Naturally he went right to first base. But much to my chagrin, the TV announcers failed to belabor the obvious. -Congressional leaders Friday morning agreed on legislation which will significantly impact Wall Street. Key House and Senate lawmakers approved far-reaching new financial rules early Friday after weeks of division, delay and frantic last-minute dealmaking. The dawn compromise set up a potential vote in both houses of Congress next week that could send the landmark legislation to President Obama by July 4. The final and most arduous compromise began to fall into place just after midnight. Sen. Blanche Lincoln (D-Ark.) agreed to scale back a controversial provision that would have forced the nation's biggest banks to spin off their lucrative derivatives-dealing businesses. The panel also reached accord on the "Volcker rule," named after former Federal Reserve chairman Paul Volcker. That measure would bar banks from trading with their own money, a practice known as proprietary trading. What really struck me was a quote by a certain lame duck Senator (emphasis mine). The emphasized excerpt of that quote is eerily similar to that of House Speaker Nancy Pelosi while in the process of a separate government power grab (i.e. The health care bill). “But we have to pass the bill so that you can find out what is in it...."
Glad to hear the liberal narrative never changes when they nationalize America's private sector. -The Twin Cities endured some nasty weather Friday evening, which included severe thunderstorms, hail, etc. However, I didn't really have a handle on how serious things were until I checked with local TV station KARE 11. So when I saw weather guy Sven Sundgaard with his suit jacket off, sleeves rolled up and the top button on his shirt unbuttoned? That's when I knew the situation was perilous! -In his ten seasons with the New York Giants, running back Tiki Barber was the team's heart and soul on offense. Over the final 2-1/2 seasons of his career, Barber had as his quarterback Eli Manning. While Manning struggled to learn the NFL game, Barber continued to excel until his retirement after the 2006 season. Since his departure from the NFL, Barber has had a rough go of it. It started in the 2007 preseason when Barber criticized Manning, saying his attempts to lead the team were, at times, "comical." Surprisingly, the mild-mannered Manning fired back, which I'm sure stunned Barber. Since then, Manning has won a Super Bowl, married the smokin' hot Abby McGrew and signed a $100-million contract extension. And Barber? Earlier this year it was learned that he cheated on wife Ginny while she was pregnant with twins. As such, he was not allowed in the delivery room last month when Ginny gave birth to twin daughters. And when the divorce proceedings began, Barber revealed he was fired from his on-air gig with NBC TV, resulting in his inability to meet the financial obligations of the divorce settlement. Perhaps Eli could float Tiki a loan, eh? As avid fan of the NHL's Minnesota North Stars in the late 70s thru early 90s, I always look for any excuse to reminisce about said franchise. Today would be as good a day as any. The Hall of Fame committee just couldn't ignore his 600 goals any longer. 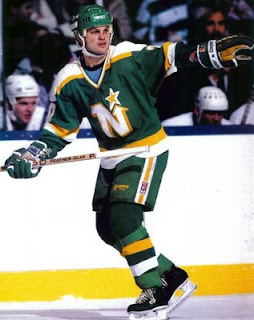 In his eighth year of eligibility, following years of disappointment after being assured, "this is your year," former North Stars goal scorer Dino Ciccarelli can finally add the words "Hall of Famer" in front of his name. Ciccarelli, one of the greatest net crashers in NHL history, tried to stay busy Tuesday morning to keep his mind off the latest Hall of Fame selection in Toronto. But when his cell phone flashed a "416" area code, Ciccarelli's heart sunk. "You start getting so emotional thinking about this," said Ciccarelli, who ranks 16th in NHL history with 608 goals. "It makes you feel like a kid, makes you remember when I first got into the game. I'm very excited. I was hoping it would come." In a career spanning 19 seasons, Ciccarelli spent his first nine years with the North Stars. As an upstart 21-year old in 1981, he was instrumental in helping the Stars reach the Stanley Cup Finals for the first time in franchise history. Even though they fell to the New York Islanders in five games, the North Stars knew they hasd a budding star. In just 32 games during that regular season, Ciccarelli tallied 30 points. In 1989, after scoring 332 goals in a North Stars uniform, Ciccarelli was traded to the Washington Capitols for Mike Gartner and Larry Murphy. Many surmise that Ciccarelli's off ice issues may have contributed to the delay in his enshrinement. In 1987, he pleaded guilty to indecent exposure after going to get his newspaper in Eden Prairie without clothes. In 1988, he spent a few hours in a Toronto jail for hitting Luke Richardson over the head with his stick. Ciccarelli has long been apologetic, saying he got himself into "pathetic situations." I recall North Stars fans having some fun with Ciccarelli's "indecent exposure" incident. "Dino the dinosaur", an inflatable doll shaped like a dinosaur, was the unofficial mascot of Ciccarelli's most avid fans. In a subsequent home game, some snarky fans placed a pair of boxer shorts on the dinosaur and draped them around the dinosaur's ankles. Despite tremendous individual success, Ciccarelli never reached his ultimate goal: A Stanley Cup championship. "I would have loved to do that. I've seen it so many times. I've dreamed about handing the Cup off to my dad and drinking out of it," Ciccarelli said. "But this is probably the highest honor personally. This is so sweet in itself." Remember the Fall of 2008 when Joe "The Plumber" Wurzelbacher unwittingly caused then presidential candidate Barack Obama to tell the truth on his plans to raise taxes? Eventually it was learned that Joe wasn't even a licensed plumber. Upon that revelation, it was as if Obama's answer about small business was irrelevant because the retort was in response to a question from a non small business owner. Pretty asinine logic to be sure. Yet despite Obama's star not shining as bright these days, he still has his blind apologists. The latest vapid spin comes from Washington Post columnist Colby King, whose staunch defense of Obama comes under the guise of a Father's Day column. Being a good father and devoted husband does not preclude a President from criticism if he is perceived to woefully lack leadership in times of crisis. Jimmy Carter, father of four, was married to wife Rosalynn for more than thirty years while he was President yet was an unmitigated disaster as a leader. Despite Carter being an avid family man, should the American public have stood idly by while double digit inflation, the Iranian hostage crisis and a gas shortage crippled this country's morale? Consider Obama: Raised by a single mother in a middle-class family where hard work and education were watchwords, Obama graduated from two of the top schools in the country, Columbia University and Harvard Law School. Ummm.....so what? Ted Kaczynski (aka The Unabomber) was a Harvard graduate, too. At age 20 no less. He also earned a PhD in Mathematics from the University of Michigan. So does that mean someone like Rush Limbaugh, a college dropout, can't criticize Kaczynski for killing three people? Now let's turn to Obama's foremost critics: Rush Hudson Limbaugh III, Newton Leroy Gingrich and Sarah Palin. Limbaugh and Gingrich have said too many negative things about Obama to count. "I want him to fail" (Limbaugh) and "secular socialist" (Gingrich) are just two of their attacks. Yet two of the nation's loudest proponents of family-values issues are serial husbands. Between them, the two men have had seven wives. Again, SO WHAT?!?! I never recall Limbaugh or Gingrich criticizing Obama for being a failure in personal relationships. Again I ask: How is criticizing the President on his fiscal policies, stances on national security and lack of leadership in a crisis in any way out of bounds? Isn't dissent the highest form of patriotism? According to Hillary Clinton, we as Americans "have the right to disagree with any administration." But what would a Father's Day discussion of the nuclear family and a moral society be without bringing into the picture Mrs. Family Values herself, Sarah Palin? The same Palin who last week said of President Obama, "It sounds like the inner circle that he has are some Chicago thugs." Well, Palin knows lawbreaking, too. Sarah Palin broke the law? Do tell! Her sister-in-law, Diana Palin, half sister of the former governor's husband, got a 15-month sentence this year. Burglarizing the same Alaska house three times for money to satisfy a drug habit is the kind of thing that can get you arrested. Wait, what?!?! Was Sarah Palin an accessory here? How is she culpable in this? Thuggery? 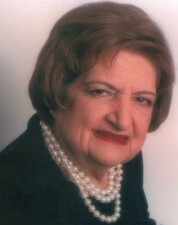 How about Sherry Johnston, the mother of Levi Johnston, the high school dropout who fathered Palin's grandson? She was arrested and charged with selling drugs; after pleading guilty to one count with intent to deliver the drug OxyContin she was sentenced to three years. Because of her medical condition, the woman who was once Bristol Palin's future mother-in-law was released from prison to home confinement, where she wears an ankle-monitoring device. I've never met Mr. King before but I surmise that he has some pretty strong legs. I mean, one must to make such gigantic leaps. Again, how is Sarah Palin responsible for the behavior of two adults who are not even blood relatives? Show me the quotes where Palin advocated (or even dismissed the seriousness) of the aforementioned crimes and I'll be one of her most vocal critics. But that's really not the purpose of King's vacuous screed, is it? And the whereabouts of 19-year-old Levi on this Father's Day weekend? His bonds with the Palins were so tight, he said on TV, that Sarah and her husband, Todd, allowed Levi to live in their house with Bristol while they dated. Conservative family values? Yeah, that must have really enraged liberals when Levi and Bristol decided not to abort their baby. Think how giddy they would have become had staunch pro-lifer Sarah Palin raised a daughter who had an abortion. Suddenly the sanctity of life would have been vitally important to supporters of the most radically pro-abortion President in history. And to think, as we prepare to celebrate this day of men and family, Limbaugh, Gingrich and Palin have the unmitigated gall to look down their noses at our president. Let that be a lesson to us all. If we have personal failings, we haven't the right to exercise our First Amendment rights. The President is leading this country down the road of financial ruin? Because of your divorce you're not able to strenuously object. Our Commander in Chief has displayed a gutless approach to the war on terror? How can you opine if you can't even stay in college for four years? Country singer Darryl Worley seems to have a finger on the pulse with his latest offering. Where was USA Today reporter Joan Biskupic during the George W. Bush presidency when the likes of Janice Rogers Brown and Miguel Estrada were blocked from Federal judiciary appointments? Only now during the Barack Obama presidency has she discovered the contentious judicial nomination process. President Obama came into office determined to stop the rightward shift of the federal courts — after eight years of appointments by President Bush — and to add more diversity to the bench. Yet as Obama tries to make gains in diversity among judges, he faces a deeply polarized confirmation process in the Senate. During his first 18 months in office, his administration has been thwarted by unprecedented delays. The situation, which has received little notice against the backdrop of a pending Supreme Court nomination and the administration's complex legislative agenda, could undercut Obama's effort to significantly infuse the federal courts with more women and minorities. Translation: When are we going to get more liberals in the Federal courts to offset the damage done by Bush & Co.? -Back in 1994, the Colombian soccer team was a favorite to win the World Cup only to lose as a result of Andres Escobar inadvertently kicking the ball into his own goal. Upon returning to his homeland, Escobar was murdered over the gaffe, allegedly because the Colombian defeat led to heavy gambling losses. I guess its a good thing they didn't win an NBA title. Violence would have been more widespread. -In the Twins 13-10, 11-inning victory over the Philadelphia Phillies Saturday, Jim Thome hit a home run in Minnesota's five run ninth inning. Thome has now homered against each of the 30 MLB teams. Last October, Vikings QB Brett Favre led his club to a victory over the Green Bay Packers, giving Favre at least one win against each of the 32 NFL franchises. Seems to me that Minnesota is a mighty fine place for professional athletes to wind down their hall of fame careers. -Is there a difference between being a "little" pregnant and not being pregnant at all? Silly question, right? Well there is just as substantial a difference between limited government and no government intervention at the Federal level. But that's not the case if you listen to President Obama. Appearing on MSNBC's Andrea Mitchell Reports on Tuesday, Politico columnist Roger Simon described a recent interview with President Obama: "...he showed a genuine irritation....when people like Bobby Jindal, you know, standing up, screaming about more federal action...a small-government, no federal aid kind of guy. And the President is calling out those people for hypocrisy." Simon was discussing a quote from Obama in that interview, in which the President whined: "Some of the same folks who have been hollering and saying do something are the same folks who, just two or three months ago, were suggesting that government needs to stop doing so much." Apparently, asking the federal government to do its job in a national emergency but not take over people's health care is the liberal definition of hypocrisy. -On the issue of the BP oil spill, Rep. Joe Barton (R-TX) apologized to the corporation in what he called a "$20 billion shakedown" by the government. With nearly 60% of the public feeling the President has not done a good job managing this crisis, Barton's statement was politically stupid. The Congressman made it worse by retracting said apology. The Barton fiasco will no doubt serve as a divergence from the fact that Barack Obama received the most BP donations of any politician (Republican or Democrat). -On a lighter note, conservative cutie MaryKatherine Ham recently announced she is engaged to be married. I was concerned that one of Ms. Ham's most smitten admirers, Sisyphus from "Nihilist in Golf Pants", would be curled up in the fetal position in the corner of a dark room. Thankfully, he emerged long enough to issue an official statement via Twitter. I've seen this coming for awhile now, but it still stings. At least his response was more expedient than that of a certain Commander in Chief dealing with a certain oil spill on an unnamed body of water. Last Friday evening, my wife and I went to dinner at the home of our dear friends Greg & Ruth. Since it was such a nice evening, we decided to walk to a few blocks to the park with their boys (Jack and Andrew) in tow. At age 9-1/2, Jack has taken an interest in baseball to where he’s now playing competitively. But since my buddy Greg grew up with a background in the creative arts (i.e. Theater, Science Fiction, etc.) he didn’t feel he could adequately assist his eldest son in the finer points of baseball. So in our jaunt to the local ball field, we took along a bat, baseball and gloves in an effort to indulge Jack in a simulated game. So after about an hour of my giving Jack a few tips, we returned to our friends’ house for a little dessert. But Jack didn’t join us right away. 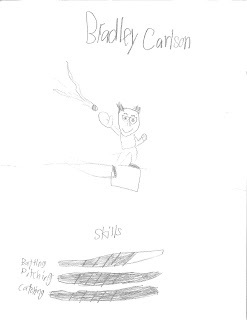 Like his Dad, he too has a creative side to his personality and thus decided to put together a visual account of our evening. 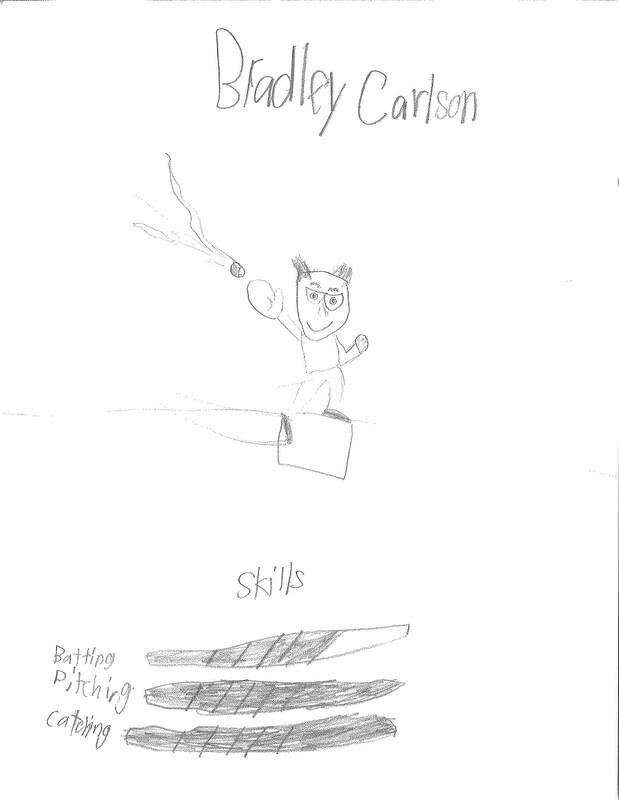 With that in mind, here is Jack’s pictorial interpretation of my baseball acuity. 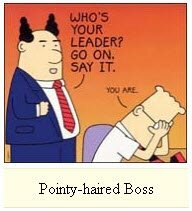 I guess he too thinks I look like Dilbert’s pointy-haired boss when it’s time for me to get a haircut. Who was killed by a Christian today? Per Tavis Smiley of PBS, Christians kill others "every single day." Cheer up, my fellow patriots! We'll continue to hear insightful commentary such as this since our tax dollars fund PBS programs like Tavis Smiley's. Makes ya feel all warm and fuzzy, eh? Helen "Jews go home" Thomas (left) is part of the White House press corps. 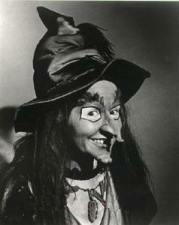 Witchiepoo (played by actress Billie Hayes) was a character in the 60s TV series H.R. Pufnstuf. The Major League Baseball Amateur draft begins tomorrow. Of all the drafts in professional sports, the MLB affair has to be the most inexact science of them all. For example, perennial All-Stars like Don Mattingly (19th round selection), Keith Hernandez (42nd round) and Mike Piazza (62nd round) were almost afterthoughts. But sometimes it's the moves you don't make that can make a franchise. Since I'm a little lazy this evening, check out my post from a little more than three years ago. All too often in today's society, people look for ways to be offended. It's almost as if "victimhood" is becoming most prevalent in our culture. Whether it's based on race, class or political affiliation, one can always gin up scenarios where their sector of society is being bludgeoned with bigotry. But these days, religion is at the epicenter of the culture war. And once again, cable channel Comedy Central finds itself in the midst of the latest controversy. It's not on the air yet. It's not shot yet. There's no pilot yet. Hell, there might not even be a script yet. But Comedy Central developing an animated project about Jesus Christ has the biggest names in the TV watchdog business forming a Super Best Friends protest super-group to preemptively smite the show. Brent Bozell (president, Media Research Center), Tony Perkins (president, Family Research Council), Michael Medved (talk radio host), Bill Donohue (president, Catholic League), Rabbi Daniel Lapin (American Alliance of Jews and Christians) and, of course, Tim Winter (president, Parents Television Council) are joining forces to form the Citizens Against Religious Bigotry. Comedy Central's "JC" is currently in development, which means it's still a couple steps away from becoming a Go project. The show is about Jesus trying to live as a regular guy in New York City and wanting to escape the shadow of his "powerful but apathetic father". With Comedy Central having recently censored frequent parenting group target "South Park" for trying to portray the Prophet Muhammad, some Christian leaders see the development of a Jesus cartoon as exhibiting an offensive double standard. Double standard? Sure. But it's not so difficult to understand why. Extremist Muslims threaten violent retribution when the prophet Muhammad is perceived to have been depicted in a disrespectful manner. In fact, Muslim violence in Europe is occurring at an alarming rate. However, even the most radical Christians eschew any crude or violent retort to the defiling of Jesus Christ or His followers. Bottom line is the entertainment industry will often take the path of least resistance in an effort to attain cheap laughter. As a follower of Jesus Christ, I find it hard to be outraged over the parodying of my Lord and Savior, much less portray myself as a victim of bigotry. If one merely examines the life of Jesus Himself, one would ascertain He suffered betrayal and physical beatings far beyond a human being's comprehension. And His words during his final hours still resonate to this day: "Forgive them, Father, for they know not what they do." And as history reminds us, Jesus had the ultimate victory three days later. I've had a personal relationship with Jesus Christ since 1986. One simple immutable truth is there's literally nothing that can jeopardize my faith and belief in my Savior, least of all a morally depraved industry which chooses to mock Him.